More than anything else, this match felt like it was about Liverpool’s return to the top table on a consistent basis. Obviously last year’s run to the Champions League final was thrilling and reminded us all what it felt like to be one of the best teams in Europe, which is something that we haven’t experienced regularly enough since the days of Rafa Benitez, but it wasn’t just reaching finals that was thrilling under Rafa. As much as we might all want to laugh at Arsenal, the club’s consistent fourth-place or higher finishes meant that their supporters got to enjoy Europe’s best club competition every single year, regularly making it through the Group Stages to boot. Admittedly, they then somewhat inevitably got humiliated by Bayern Munich, but it gave the club a cachet that allowed them to, for example, persuade Alexis Sanchez that his future lay in North London rather than Merseyside. That’s why what excited me about the match against the Ligue 1 champions wasn’t the opposition as much as the competition itself. You see, we’ve all been telling ourselves that the club is back, that Jürgen Klopp is building something special and that we’re once again a force to be reckoned with, but for two seasons in a row we’ve only definitely made it into the Champions League on the final day of the season. This match was as much about proving that we deserve to be there as it was about getting the three points. Much like Manchester City, Paris Saint-Germain are the antithesis of the Reds when it comes to the type of club that they are. Bought by rich owners, their success over the past six years or so feels somehow tainted, having been taken over by Oryx Qatar Sports Investments in 2011. Liverpool supporters are mocked by fans of opposition clubs for believing that passion is worth more than cash and this was a chance to prove as much, just as when the Cityzens visited Anfield last season. Many felt it was more reflective of a match that should’ve been played at the semi-final stage, but did it live up to its billing? When Liverpool played Sevilla in the Europa League final during Jürgen Klopp’s first season, there was a moment after the Spanish side had taken control of the match wren the manager turned to the crowd and threw his arms up in the air, asking for encouragement for his team. Vast swathes of the fanbase were critical of him for that, believing that he should have been trying to influence the game tactically rather than seemingly pinning the blame on the supporters. I’ve always thought that that was a grossly unfair reading of the situation; after all, this wasn’t the manager’s squad really and he’d done the best that he could with a group of lads that had been struggling to find a rhythm under the previous regime. In my opinion, the German knew that there was only so much he could do from the bench but that the supporters could change everything. It’s why the manager continually bangs on about atmosphere every single time he gets a chance. It’s why the players talk about how it makes them feel during matches. It’s also why opposition fans hate us so much. Few clubs in world football have the passion and atmosphere that Liverpool boast, with even fewer having a ground that can make the difference in the same way that Anfield does. Last night we saw it in action, as one of the most expensively assembled squads in the game struggled to cope. Yet I do have some sympathy for those that wanted to criticise the manager in the wake of the match in Basel; tactics, after all, do make a difference. When the two things are combined, though, there’s very little that visiting sides can do to stop it and it’s fair to say that the manager absolutely nailed his tactics last night. Paris Saint-Germain got their goals by seizing on mistakes that Liverpool players made. They managed it because they have got some genuinely superb players in their side, with Kylian Mbappe being one of the biggest talents anywhere in the world right now. Neymar takes a lot of stick because of his diving and his general attitude, but when he’s on his game the Brazilian can be a difference maker. There’s also the small matter of Edison Cavani, who has been scoring goals for fun throughout his career. Yet there was a surprising lack of togetherness and teamwork from Thomas Tuchel’s side, the players instead seemingly out for themselves at every opportunity. That’s the attitude that has made our front three look at its worst in our first few games, but when they play together and don’t care who’s scoring the goals then they’re absolutely electric. It’s the rest of the Liverpool team that deserves the plaudits, though. PSG spent close to £400 million on two players, whilst our defence was made up of a twenty-one year old centre-back recruited from Charlton Athletic, a nineteen-year-old who came through the Academy and a twenty-four-year-old who came to us after being relegated with Hull City. United, Spurs or Everton supporters would point to Virgil van Dijk and it’s entirely fair that attention should be brought to the £75 million signing we brought in from Southampton, yet to concentrate solely on him would be to ignore the incredible work that this defence is doing. Unlike some high-profile managers at clubs along the East Lancs Road, Klopp is happy to work with what he’s got and help them to improve where he can, turning to the chequebook only when he thinks it’s necessary rather than as a matter of course. The result is a team that is made up of players who are happy to cover each other’s backs whenever necessary, with the midfield putting in an absolute shift all night long. There are still some that will watch that game and criticise Jordan Henderson, but those that are doing so fundamentally misunderstand the job that the former Sunderland man has been asked to do. 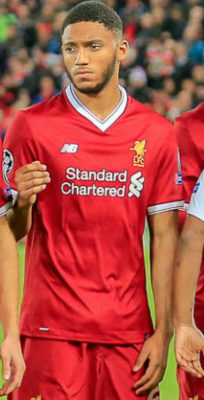 I’m not going to go over it all again here, having spoken of him highly in previous pieces, but what I will say is that if you watch his performance from last night and come away from it thinking that he’s a problem for this Liverpool team then you might as well admit that you have an agenda against him and just try to ignore him whenever possible. He was absolutely immense, giving the Parisian side no time to settle and working in tandem with James Milner and Gini Wijnaldum to close down the space, limit the passing lanes and disrupt the opposition’s rhythm at every opportunity. Must say, although overall PSG were poor (or made poor by LFC), thought Thiago Silva was immense, only let down by his teammates. Also not a coincidence that Liverpool probably only made two errors all game, and were punished for both. Great players but not a great team, yet. Even the front three, that I’ll come on to take about in a moment, worked its socks off even whilst struggling to click properly. The entire team knows that it needs to be more than the sum of its parts week-in, week-out if it’s to have any hope of success. There really is hope of success, too. Whilst I personally want Klopp to concentrate on the Premier League and finally take us to the promised land, this is a squad filled with talent that believes it has the ability to do great things. This was cited as a run of fixtures that would bring our season crashing down around our ears, but so far we’re six games into the campaign and have won every single match we’ve played. Bigger challenges are yet to come, that much must be said, yet as long as we don’t forget that we’re a team and not a collection of individuals then we could do something truly special. In the post-Tottenham piece that I wrote I talked about Daniel Sturridge showing that he doesn’t have what it takes to be an important part of this Jürgen Klopp side. My argument, and it’s one that I still think holds water to some extent, was that it simply isn’t part of his game to close, press, harass and close down in the same way that Roberto Firmino likes to do. What he showed last night was that he can still be part of this team without adding any of that to his game. Whilst he didn’t do much in the way of closing players down, what he did do was shut off the passing lanes for Paris Saint-Germain and thereby caused them to rush things and make mistakes. The manager seemed to suggest after the match that Firmino probably could have played from the start but that the England striker had earned his start; in the end he’ll have been glad that he made the choice that he did, with Sturridge opening the scoring and his Brazilian counterpart netting the winner. I’m still not sure that he should be starting games regularly if the manager is going to setup as he did last night. I don’t think, for example, that it’s a coincidence that Mo Salah had his worst game for the club at a time when he was asked to play with an out-and-out striker rather than someone who is willing to sacrifice space centrally in order to give others a chance. In my opinion, we’re at our best when Firmino is leading the line and Mo and Sadio Mané are the ones exploiting the space that he makes for them. Yet I do think that the striker should be the man that Klopp build his secondary side around. Put him on the pitch with Mané as a more traditional winger and Xherdan Shaqiri in support on the other side, ask them to play more conventionally and I think he’ll thrive. We saw exactly what he can do when he’s provided with the ammunition to cause problems thanks to Andy Robertson’s excellent ball in. Unlike so many people on social media, I’m more than happy to admit when I’m wrong and, in the case of Daniel Sturridge, I’m delighted that he’s made me look a fool.